Outré Theatre Company opened its production of tick... tick... BOOM! at the Mizner Park Cultural Arts Center on May 24, 2013. Jonathan Larson, the creator of the Tony Award and Pulitzer Prize winning musical Rent, penned this autobiographical musical which tells the story of an aspiring composer living in Soho at the end of the 1980s. Torn between the struggles of trying to achieve his dreams and the siren song of a settled, middle-class life, Johnny searches for the courage to risk everything in the pursuit of his art. His girlfriend wants to settle down and raise a family, his best friend is a financially successful ad executive — and Johnny waits tables and composes as he strives for his big break. Skye Whitcomb directed a cast that included Mike Westrich, Sabrina Lynn Gore, and Jerel Brown. Built around an impassioned and winning performance by Mike Westrich as Larson’s stand-in, Artistic Director Skye Whitcomb and Music Director Kristen Long have created an emotionally satisfying evening worth the trip to Boca Raton. Danny Butler’s sound design under Giordan Diaz’s stage management adapted early on and enabled the lyrics to be comprehensible most of the time. Stefanie Howard’s lighting was emotionally evocative although it seemed awfully fidgety, switching many times in the course of a single number. Outré Theatre Company’s tick, tick...BOOM! is a wonderful interpretation of this New York-centric romp. The cast knows how to deliver the rock-tempo songs and a wonderful four-piece band, led by music director Kristen Long (a musical composer herself), never misses a beat. Westrich has a strong voice and is a talented actor and it's really what's necessary for a show like this to be successful. He is confident and acts as the centerpiece that keeps everything accelerating around him, as well as it should be. Skye Whitcomb’s direction keeps the show moving along with plenty of crescendos in all the right places. He’s also credited, along with Nori Tecosky, for the scenic design. It shows in how he uses every inch of the set’s space − pieces, with their musical embellishments, which are bright and colorful, and are perfectly in keeping with the tone of the show. The production’s depth of understanding adds yet another layer to Larson’s delightful and introspective show. “With only so much time to spend, I don’t want to waste the time I’m given,” Johnny sings. You’ll leave the theater thinking about your own passions and soul searching, while feeling like your time spent with Johnny was well worth it. Outre Theatre Company's mission states theatre should be raw, visceral, thought-provoking and action-inducing, well they are right on point with there brave new choices in musicals, that have not been shared with Florida theatre audiences. The cast do an excellent job retelling Larson's journey. Mike Westrich (Johnny) just seen recently in the critically acclaimed BRTG production of "Chicago" stands out as the lead with his vocal talents and acting choices. Sabrina Lynn Gore (Susan) who shined as the star of "The Wild Party" for Outre Theatre Company, once again proves you could give her any role and she would find every unique way to make it her own. Jarel Brown seen as chorus in BRTG production of "Chicago" gets his largest role to date. Jarel sings with his wonderful raspy vocals. His acting may not be as strong as his counter parts but the "tick tick Boom!" journey is delivered. 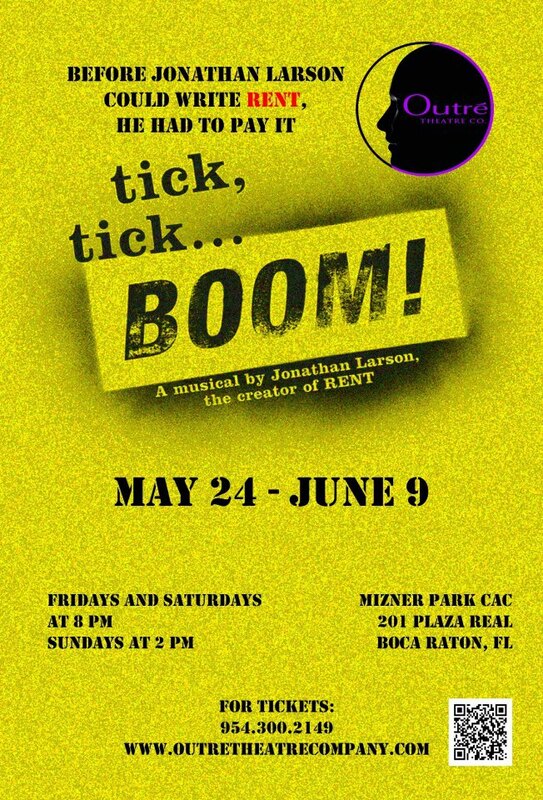 Outré Theatre Company presents tick... tick... BOOM! at the Mizner Park Cultural Arts Center through June 9, 2013. The Scene for May 17, 2013.